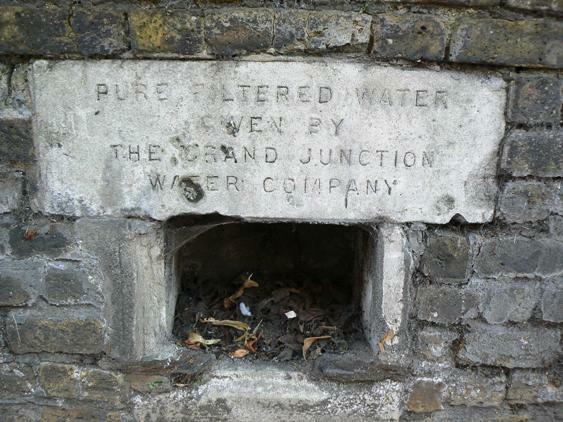 The Grand Junction Water Company provided a water fountain on the High Street side of St Lawrence's churchyard in 1862 (Q50), accessible to anyone walking along the High Street. As the outlet pictured is at lower shin level I think water was also supplied from a pipe a couple of feet higher up which ran through a nearby incised stone. The 1865 Ordnance Survey map shows 'Water Fountain' here and it is also visible in the 1880 sketch of the church and High Street by Auguste Ballin (see 'Brentford Past' by Gillian Clegg, p.5). In 1880 the High Street church wall was topped by iron railings and there were two arched wrought iron access gates with central lamps.